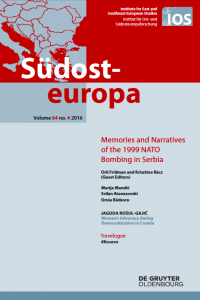 An interview with Memory Studies scholars Orli Fridman and Srdjan Atanasovski about a new publication exploring memories of the NATO bombing campaign to end the Kosovo War. In March 1999, NATO launched airstrikes against Serbia and Montenegro to force Serbian forces to withdraw from Kosovo. There is no international consensus on the death toll from the 78-day bombing campaign, though the Humanitarian Law Center’s research states that the bombings directly resulted in almost 800 casualties–including civilians–in Serbia, Montenegro, and Kosovo. The authors of the “Memories and Narratives of the 1999 NATO Bombing in Serbia” special volume use social memory studies to investigate how ordinary people remember the events. Authors Krisztina Racz, Orli Fridman, Marija Mandic, Gruia Badescu, and Srdjan Atanasovski analyzed the memories of people in Serbia over a decade after the bombing, media coverage of commemorative events, and how notions of ‘collective victimhood’ and responsibility are inscribed in urban space. What they found was a more complicated picture than the ‘Serbian state sponsored narrative of victimization.’ In Serbia, it was a time of fear and chaos, but also of Belgrade’s ‘best parties in town.’ Author and co-editor of the publication Racz, for example, researched memories of intellectuals from the Hungarian minority in Vojvodina. The essays engage with the politics of memory and the social construction of collective remembering. The articles reveal that there is no simple, collective memory in Serbia of the 1999 bombings. What the editors did find, however, was overall a disconnect between the memories of the bombings and an understanding of the Kosovo War. “The narrative about Kosovo is completely absent… [in my research] nobody mentioned Kosovo as the reason for the bombings. [When discussing it] they started from their own personal experiences and perspectives,” Racz said. Prishtina Insight sat down with two researchers from the publication–co-editor and author Orli Fridman and author Srdjan Atanasovski–to discuss this contradiction and other findings. PI: How did the project “Memories and Narratives of the 1999 NATO Bombing in Serbia” begin? Fridman: It started with a joint research project titled “On the Receiving End of International Intervention,” which aimed to offer a critical approach to international interventions. The Center for Comparative Conflict Studies [CFCCS] at Singidunum University Faculty of Media and Communications [FMK] cooperated with the Center for International Intervention [cii] at the University of Surrey. Following the project, we held a workshop in Belgrade and had an open call for people to present papers on memories of the NATO bombings. When I started this research, the only academic text I could find was a text by Krisztina [Racz], which was an MA thesis from CEU. There was nothing critically approaching this topic. We opened a call and got a large number of proposals. We had a workshop with 10 people, and from those 10 papers, we published five in this co-edited special issue. PI: Why did you choose to investigate the 1999 NATO bombing within the framework of Memory Studies? Fridman: The topic of international intervention is well researched, especially by International Relations scholars. Our aim was to approach the topic from a bottom up perspective of analysis. Our main research question was how the people intervened upon experience, talk about, and remember interventions. We in Belgrade just focused on the NATO bombing, and the entry point was from social memory studies, which aims to expand the analysis of these processes beyond transitional justice [which is more commonly discussed in the Western Balkans]. It was two-folded in terms of being within broader discussions about international interventions, and then we zoomed in to look at it from the perspective of social memory studies, understanding that this can give us more insight into the issues that came to the surface during the data collection. Atanasovski: When I found out about the call for papers, I was very involved with what is commonly referred to as Affect Studies, but from the point of view of music and sound. When I started engaging with affect theories, I had an idea to apply it to the topic of NATO bombing–to take this apparatus that I had developed for something different and to basically try to match an analysis of everyday life during the NATO bombing through Affect Studies. The two keywords that I started off with were sound and surprise. Many people, me included, were utterly surprised that the bombing actually happened in the end. The whole bombing was a series of surprising events for ordinary people. I was trying to understand how people gave meaning to these surprising sounds, and how other apparatuses actually started producing sounds. For example, the Milosevic regime started hosting these daily concerts to defend bridges, and daytime concerns to gather people around the square. This first-hand experience of bombing is still somehow influencing how we remember, and how critical we are about this event. And then of course, what is also great to think about in this context, is that NATO itself made these so-called ‘sound bombs.’ They would have airplanes breaking the sound barriers, using sound as another weapon. I tried to see how one gets thrown into a new sensory world, to sounds that you’re not used to, and you have to make sense of it. And how this governing apparatuses kind of convinced you about which direction to go in order to build sense out of it. And this first-hand experience of bombing is still somehow influencing how we remember, and how critical we are about this event. PI: Did the works come together as one cohesive piece? Were there any major contradictions you noticed? Fridman: When we study memory, we need to look at different ‘mnemonic communities,’ or different communities of memory. Collective memories are not coherent or static. As large as the topic may be, we needed to look at various locations and groups. PI: Orli, you’ve researched how state calendars and unofficial calendars are important to understanding how Serbians memorialize the NATO bombing. Fridman: Yes, I’m also working on the issue of calendars, on understanding the new calendars in the post-Yugoslav successor states and the alternative calendars. Theoretically speaking, it’s about how the calendar becomes a site of the social construction of memory, and looking at what we erase and include in the calendar as kind of a negotiation. Of course, calendars can change greatly, like if you look at the Yugoslav calendar and the post-Yugoslav calendar in Serbia… When you look at the new calendars, one question we can ask is, what events from the ‘90s are included in the calendar? If you look at the Serbian calendar, some events were elevated and discussed, even though they aren’t officially yet on the calendar. This is interesting for me… March 24th was not an official day on a printed calendar. But over the years [it was commemorated in public]. I think the peak of it was in 2015, when there was the ceremony in front of the ruins of of the former Generalstab building. It was live on TV. You will see representations of this event in the media, but I am more interested in how such commemorations or lack of them are relevant to ordinary people in their everyday lives. Do people massively join commemorative events? I don’t think so. Do people presently remember it as a day, and if so, what does it tell us about how it is being framed for the society and the younger generations to remember? PI: Your paper also discusses the divisions that existed in Belgrade anti-war activist circles in the ‘90s, people who saw the bombing as justified and people who did not. Do these divisions still exist today? Is it still a conversation? Fridman: Not so much in my opinion. I think the discussions are centered around [the question]: how critically do you view the events of the ‘90s all together? Of course, the division you can see is in word choice. Do you call it the NATO bombing, or do you call it the NATO aggression? Atanasovski: Basically only the beginning of the NATO bombing has become a moment, a date, of memory. It tells you a lot that very few events from the bombing itself are separately being commemorated, apart from the [bombing of] the Radio Television Srbija building. Again, this commemoration is much more private, for the families. For me this is a symptom of how empty this memory is. You remember the general idea that you have been bombed and you remember the general trauma, which in my opinion is in many ways primarily a sonic trauma. You experienced this kind of attack on your sonic space. There’s this general idea of ‘our victimhood,’ but not a lot of flesh in it. I think that it’s very tricky to open this kind of discussion about the ‘90s starting the with the bombing. Because, even if you are critical of the ‘90s, it’s very hard not to also be critical of the NATO intervention. In any moment, someone can play a trump card of reminding you about some particular victim, a child. Usually people who want to be critical about the ‘90s don’t start with the bombing. In Serbia I see people who don’t know what happened in Kosovo in the context of the ‘99 bombing, let alone in the years before. You cannot enter [discussions about] the ‘90s from ‘99. Because so much happened before. From my research, I got a sense from people–especially [anti-war activists]–of the exhaustion that people had at that point already. We have to put it in that context. If anyone opts to start from ‘99, it’s to place the victimization at the center of the argument. And yet what I found, which again plays in service of the current dynamics, is the extent to which the population is unaware about the ‘90s. In many ways this is also the case in Kosovo. Here many from the young generation don’t know about the non-violent civil resistance that occurred a decade before the war. It’s not the same, but in Serbia I see people who don’t know what happened in Kosovo in the context of the ‘99 bombing, let alone in the years before. PI: You see disconnect in Serbia between memories of the bombing itself and knowledge about the Kosovo war? Fridman: There is a complete disconnect. I listened to many young people who think that the bombing was simply against or because of Milosevic. Atanasovski: At one of these March 24 commemorations, there was a discussion about the Generalstab building, about what to do with it. One of my friends on Facebook wrote ‘oh, we are not doing this right. We should put a huge metal plaque in front of the building with the names of everyone that was killed in the bombing to commemorate it.’ And I replied, ‘well, maybe you won’t like this plaque, because most of the names will be Albanian.’ And he was confused, and said ‘Albanians didn’t serve in the Yugoslav army.’ He completely didn’t understand that the vast majority of people who were killed by the bombings don’t have Serbian names. Fridman: If you look at the research about human losses, people don’t know during the bombing there were Albanian victims too. I’m teaching local students [in Belgrade], and when they choose to engage with these topics, and I give them resources from Humanitarian Law Center, the Kosovo Memory book titled “Let People Remember People,” they’re shocked. It comes as the most unknown data. Atanasovski: This is not really in my paper, but what fascinates me about the bombing as a phenomenon is that some people who participated in events like the concerts… their physical participation is somehow now preventing them from changing their opinions. They feel this need to remain faithful to their own actions… what people thought then is so engraved in the body that it’s difficult to go back and reframe it. There is very little space to think about it critically. Little space to actually think—what was it? What did people experience? And it is important that I position myself—I am not from the Balkans and I did not experience the bombings myself. But I did experience in my own society [in Israel in relation to the Israeli-Palestinian conflict] the lack of critical space… that there are these grandiose events that happened, that generated statements and ideas. But when we actually enter conversations, to say—wait, where are we in this? What comes to the surface is the everyday life, is what we felt and what we wanted, which is not always in line with how those narratives are socially constructed. So what has emerged in my research in Serbia is important as well, not just a national cohesion and the rallying behind a flag. It’s interpersonal relations, the sense of solidarity between people that often happens in these situations. It was the great fear, it was the best parties in town or funny sense of humor. It was many things. This is about the NATO bombing, but beyond that event, the theoretical approach of memory studies can open the discussion about contested memories and enables us to point to the construction of a hegemonic, state sponsored narrative versus alternative ones. And in this space between, there’s so much more to look at. Even when we look at the assassination of [Zoran] Djindjic, and how little commemoration there is in Serbia, or when a new government that comes to power wants to appropriate his memory. These are also important topics that have emerged while conducting this research. As I was talking to people… [I began thinking about] how memory is now shaping the relations between Kosovo and Serbia for the new generations. My entry point of interest is in conflict transformation processes. The current platform of ‘normalization of relations’ is offering so little for people. It has no substance or relevance to ordinary people. Conflict transformation at its heart is about changing the relationship between groups in conflict, in relation to power relations and equality. I think that the disconnect between ’99 and not only the Kosovo War but also what happened in Kosovo since ‘89… I think that [Memory Studies] has a potential to rebuild relationships. Not through the competition of who was more of a victim, but through looking back at the history and understanding it can be shaped in purpose of the present, or how it can also allow an opening towards a different look at future relations. Looking at Memory Studies allows us to broaden the scope of our understanding of conflict analysis. Fridman: Though there is no discussion. There are no complexities. There is no questioning… not only questioning. I mean there’s no real questioning as societies to re-think ourselves. It’s obviously not unique to Kosovo-Serbia, but particularly in this case, it’s a very important question… Looking at the intergenerational dynamics of memory—what this brings is important to us, the nuances of the process of remembering and forgetting. And I think it begs for more research. *This interview was edited for clarity and length. Orli Fridman is an associate professor at the Faculty of Media and Communications at Singidunum University, where she heads the Center for Comparative Conflict Studies (CFCCS). She also is the academic director of the SIT study abroad program in the Balkans (Peace and Conflict Studies in Serbia, Bosnia and Kosovo). Kirsztina Racz is a PhD student at the Balkan Studies doctoral program at the University of Ljubljana. *Featured image by Orli Fridman.